The mystery of the sailing stones of Death Valley has till date no precise explanation. It is a natural phenomenon without outer worldly traits which have baffled and humbled humans since centuries...Sailing stones of Death Valley is a rare and natural phenomenon which has left experts baffled for generations. These stones or rocks slide on their own and leave long tracks along their path of movement. These tracks are found in a number of places all over Racetrack Playa. No one has actually seen the rocks moving because the tracks are made at a very slow pace and take about three to four years to form, while the stones are believed to slide every two to three years. Let us learn some more interesting facts about these gliding stones. These stones have a mind of their own and are completely unpredictable. Sometimes two stones may set out together while creating parallel tracks. However at some point you may find the tracks parting ways in opposite directions! There have been cases of tracks being found wherein the stone moved forward, made a substantial track and then returned back to its original spot. Sometimes the rock may turn over on its own and create a different pattern of tracks! This occurs because the new surface of the rock will create competitively unique tracks of its own than the previous surface. There has yet been no proper scientific explanation for such a phenomenon and is truly shocking to the logical mind. These tracks are usually 2.54 cm deep, 3-12 inches wide and hundreds of feet in length. These tracks can be seen stretching across the floor from far away distances. One of the theories put forth by experts is that the stones need wind in order to be pushed forward. However some of the stones are as heavy as humans and cannot be merely moved by strong winds. While the second theory states that ice sheets may be responsible for making the stone catch the wind and propel itself forward in floes. There is a lake in the playa of the Death Valley which during winters contains some bit of ice. The water moves forward along with the ice crystals. It could be possible that it is the water moving forward which is pushing the stones along with it. As for the heavier stones, they may move very gradually as and when the clay soil becomes slippery enough for the stone to slide along with the water. It may be this movement which causes the tracks to appear on the soil. While some experts believe that the stones may be moving because of moving ice sheets, which slide forward due to heavy winds as well as gradual melting. There have been many studies conducted on these stones, one extending for seven years. This research was conducted by Bob Sharp and Dwight Carey who monitored the movement of the stones by corralling the stones, naming them and then fixing rebar segments to them. However, no answers were found. There are many who truly believe that these stones have magical and spiritual properties. The ancient Native Americans were the first settlers of this land. They named it the tumpisa which literally meant rock paint. These people worshiped this land as sacred grounds and believed that the sliding stones were the work of god. They are proof that man cannot explain everything and that supernatural forces do play a role in the events of this world. There are also some theories which eventually end up with possible alien connection. That aliens may have landed on the sailing stone playa area and caused the stones to slide. Or that the stones are not from earth and have been deposited here by aliens, to prove their presence. There seems to be no plausible explanation for this strange occurrence and no amount of advancement in science and technology has been able to give actual answers. Whatever may be the reason, the fact remains that this inexplicable phenomenon has captured the imagination of many, all over the world. While more and more theories will be created as to reason its occurrence, we will just have to wait for this mystery to unravel itself. For the present, the sailing stones of death valley have become a sacred ground for both the scientist and believers alike. 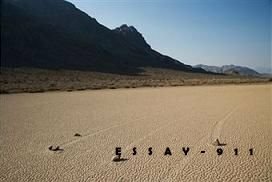 Sailing Stones of Death Valley 9.1 of 10 on the basis of 2002 Review.